The Presidential candidate of the PDP, Atiku Abubakar, has dismissed insinuations that Gov Nyesom Wike has resigned as the South-south coordinator of his campaign. Atiku’s Special Assistant, Public Communications, Phrank Shaibui, insisted that the former Vice President Presidential Campaign Council (PCC) is intact. Shaibu also insisted that Wike’s purported resignation was “speculative”. 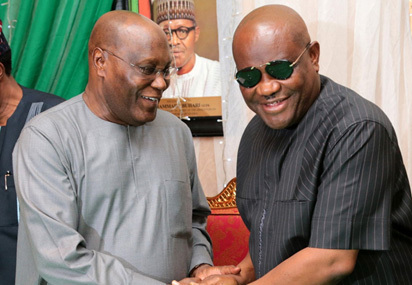 It is understood that Wike is not comfortable with the way things are going in the campaign, especially lack of consultations of appropriate party leaders before vital decisions and appointments are made. The PDP had in October named Senate President, Bukola Saraki, as Director-General of the Atiku Presidential Campaign Council, along with prominent leaders of the party as zonal coordinators.